One obsession with new authors is checking their ratings on Amazon, these do go up and down like a yo-yo, so you cannot get over excited by one days stats. I did read that once you if you offer a free download for a few days on Kindle, then your rating will shoot up. fortunately this did prove to be true on Amazon UK and US. The free download will also add you book or ebook to ‘Customers who bought this also bought.’ Which in turn will help your rating in the future, well that’s therory. As most of my sale seem to be in the UK, these are the important stats for me personally. I checked other books about France and ex-pats in France and most of the top selling ones were under £2 or $2.99, so I slightly lowered my price. I also noticed that my ebook was slightly in the wrong category, as most books similar to mine were in Travel-Europe-France. So I went into KDP and deleted my category, which you have to do first, then I added it in the correct one. After checking my statistic yesterday, I found that I am now selling 5 to 7 books a day, it was one a day prior to the free offer days. 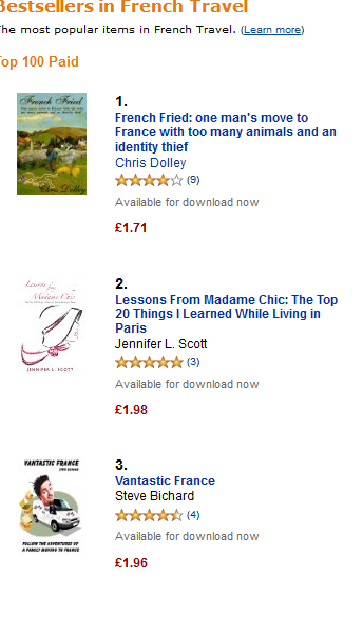 My position in the new category had come up from 63 to number 3 position on Amazon UK. It has also crept into the ratings on Amazon US in the same category as number 80, where it was not even showing before. The more advice that you look for on the KDP forum the more confused you get, many said do not do the free offer with KDP select. Others said go for it, as they had achieved thousands of downloads. Well I didn’t quite get into the thousands, but my e-book has now had over 200 downloads in a month, which I feel is not too bad for my first novel. I have also picked up a couple more reviews, which to is a very important factor in helping to increase sales. So if anyone reading this post has put a review, can I say a very big thank you. This entry was posted in Marketing and blogging advice, Publishing on Kindle and tagged Amazon Kindle, Amazon.com, E-book, France. Bookmark the permalink. I’d be delighted to host a guest post from you on my blog if that’s something you’d be interested in. I have 200+ visitors most days, and many are expats in France, or interested in becoming expats in France, so I’m sure your book would appeal to them. Hopefully you’d get some sales! Thanks very much for the offer Steph, I will get something together.